This CellML model runs in OpenCell and COR to reproduce the published results. The units have been checked and they are consistent. ABSTRACT: A computational model of the human left-ventricular epicardial myocyte is presented. Models of each of the major ionic currents present in these cells are formulated and validated using experimental data obtained from studies of recombinant human ion channels and/or whole-cell recording from single myocytes isolated from human left-ventricular subepicardium. Continuous-time Markov chain models for the gating of the fast Na(+) current, transient outward current, rapid component of the delayed rectifier current, and the L-type calcium current are modified to represent human data at physiological temperature. A new model for the gating of the slow component of the delayed rectifier current is formulated and validated against experimental data. Properties of calcium handling and exchanger currents are altered to appropriately represent the dynamics of intracellular ion concentrations. The model is able to both reproduce and predict a wide range of behaviors observed experimentally including action potential morphology, ionic currents, intracellular calcium transients, frequency dependence of action-potential duration, Ca(2+)-frequency relations, and extrasystolic restitution/post-extrasystolic potentiation. The model therefore serves as a useful tool for investigating mechanisms of arrhythmia and consequences of drug-channel interactions in the human left-ventricular myocyte. 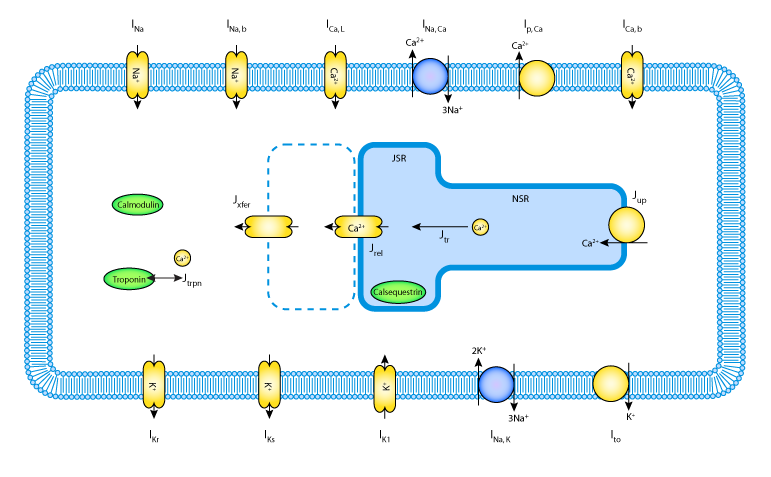 A schematic diagram describing the ion movement across the cell surface membrane and the sarcoplasmic reticulum, which are described by the Iyer et al. 2004 mathematical model of the human left-ventricular epicardial myocyte. Derived from workspace Iyer, Mazhari, Winslow, 2004 at changeset 2d04beaa020c.